This is something of a round up post of all things Big Chill and Bird related. I went to the Big Chill music festival at the beginning of the holidays (where has the time gone? ), and as well as enjoying lots of great music (Massive Attack, Paloma Faith and Newton Faulkner being particular highlights) I also discovered what can only be described as charity shop heaven. Racks and racks of cable knit jumpers, school blazers, 'dressing up' clothes (aka wedding dresses, sequinned jumpers and University gowns - one of which I bought: it looks like a rather fetching Navy cape) plus a huge box full of hats to rummage through. Here I'm featuring three of the £3 hats I managed to find at the wonderful Oxfam stall. Nestled among old policemen's helmets and lurid wigs lurked a number of wide-brimmed vintage beauties. I wanted to accessorize this trio with some other treasures I brought back from the Big Chill. Firstly, two fabric birds made at the Selvedge stall. I'd already seen various issues of this predominantly textiles, design and photography based magazine, after being recommended it by several people. It is GREAT and a very inspiring read, so if you can get your hands on a copy - do! It was lovely to meet the people who put together the magazine, while simultaneously using assorted fabrics (including Cath Kidston - they'd all been donated for the stall) to make multicoloured birds. One had the option of hanging them in a tree, but we wanted to take ours home, and subsequently turned them into accessories! The first one, worn as embellishment on a brown hat and with a skeleton leaf necklace from my paternal grandma was given a suitably flamboyant turquoise ribbon ruff! The second - suspended as an overlarge pendant here - was complemented with the fantastic wide brimmed camel hat (as all the magazines would say - "very on trend, colour-wise daahling"!) and an amber ring inherited from my maternal grandma. The third and final has a different bird accessory - in the form of a Tatty Devine ring I bought, after joining in with their colour-your-own acrylic pendant template activity (handily placed in the same tent as Selvedge). It was a hard call between this ring, or some swallow earrings they had on sale. Scrap that, I wanted everything there! The acrylic shapes just called out to be touched and admired and have a real sense of fun... Here I wore the ring perched on my little finger, with a grey hat. At the stall, we agreed the best way to wear it was as though the tiny bird had just alighted! Both my mum and Dad took turns with the camera, with the setting being a massive felled tree covered in moss and rambling blackberries. The title is taken from the Hitcock movie of the same name. I have to admit I've never seen it it, not being one for horror movies! However, I loved his direction of Dial M for Murder - set almost entirely in one claustrophobic room and yet incredibly gripping. And with added style in the form of Grace Kelly! Back to school on Tuesday! It seems this holiday has been of the blink and you'll miss it variety. Although we haven't been abroad, our family has managed to make its way around large swathes of Britain in the past six weeks, leaving not as much time as I'd hoped for blogging and replying. And I'm off again today - a final mini visit to friends in Bristol. Hopefully this will give me the chance for an urban shoot or two, and some back to school shopping! I'm hoping to get some black brogues for school, and can't wait to start wearing cable knit tights again. Autumn has most definitely reared its auburn head. Thank you for all your wonderful comments on my leather shearling coat, I've been wearing it nonstop since that post! Hopefully once term has started and I have more of a routine, I'm going to be setting up an interesting blog project, so watch this space! Great Photos, by mom and dad. That bird ring is amazing! Inspired, as always. I love the bird accessory in the first and second picture! The pictures are lovely as always! I have purchased some black brogues for school from topshop and I went back today. My summer seems to have gone very fast as well! Love the outfit. Yor ring is awesome! 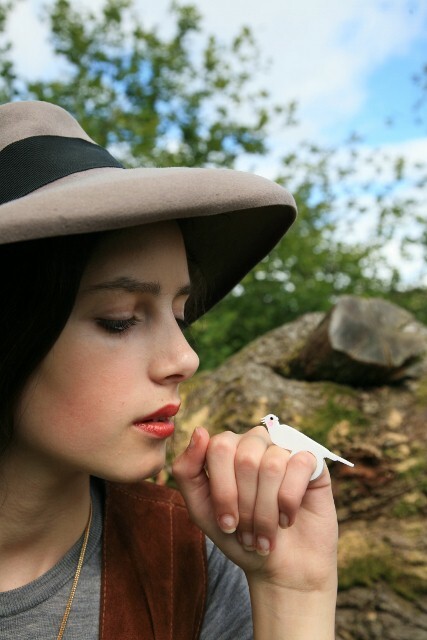 I love the birds-accessoires and I´ll try to copy this work and make one of them by myself! I love it to experiment with things like this! You rphotos are beautiful and I love especially the first one! lovely! that ring is very pretty. Sometimes an outfit comes along that is so harmonious and perfect that you don't realize its made up out of different pieces! I didn't think about the individual pieces of your outfit until I read your explanation in the subsequent paragraphs .... I went back to the pictures and was stunned by the ensemble they all create! Also, perfect autumn colors. Your rings are too cute!! You have such great style. And I think it's better that you haven't seen the Birds - not a very good scary movie, and one of the worst endings. And amazing overall!! Another gorgeous set of pictures! 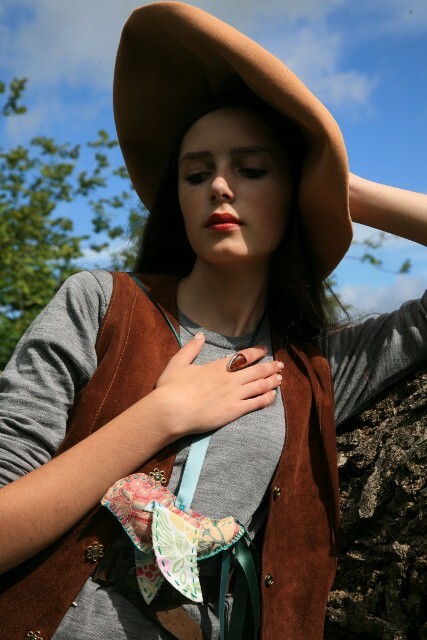 Delightful accessories!!! beautiful, as always! love the brown! p/s check out & enter my mini giveaway babe! Love love love love LOVE that ring- you definitely made the right choice! 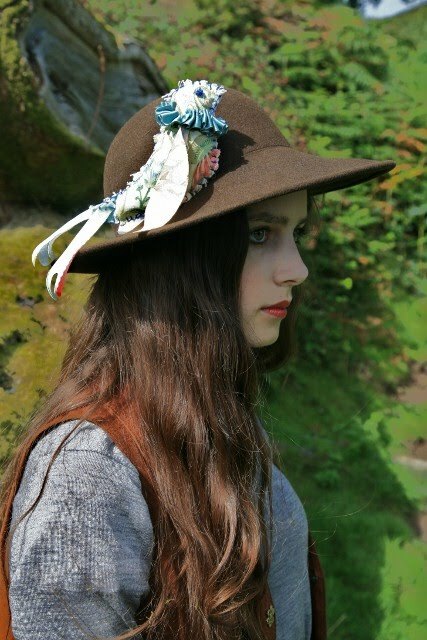 The hat is gorgeous too- only £3!! Bargain! Can you check out my blog please? Thanks! wow, what a chic, woodland-creature-like outfit! 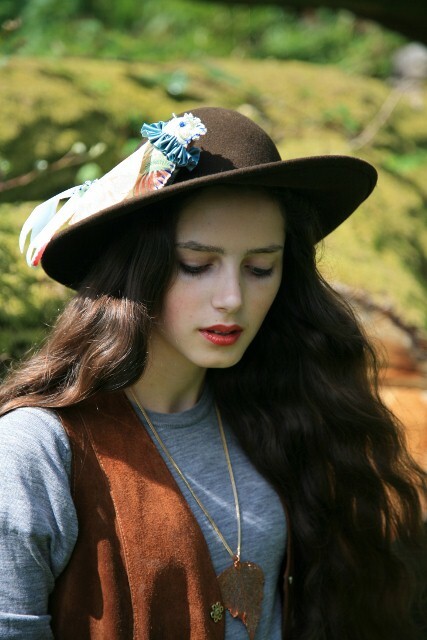 i adore your bird accessories and the touches of rich brown! I absolutely love your hat. your lipstick is so complimentary on you, as is the brown hat. and yes, i think picnicking in the drizzle is a rather british thing. the music fest sounds awesome. i am a *huge* massive attack fan. that waistcoat is very rad.